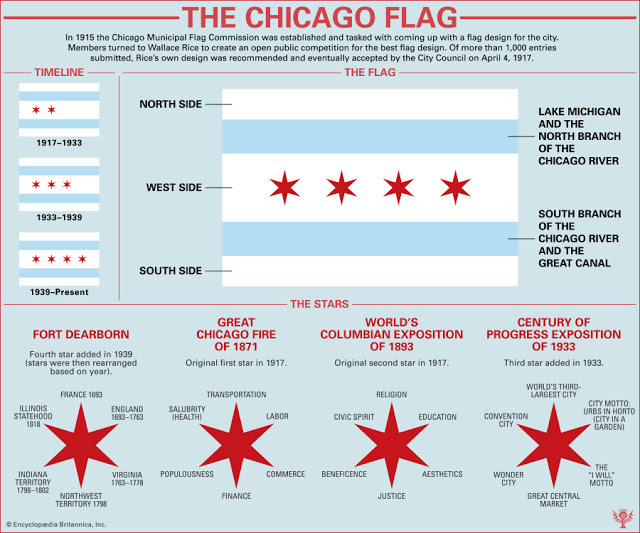 The Meaning of Chicago's Flag. Top White Stripe represents the North side of the city. Center White Stripe represents the West side of the city. Bottom White Stripe represents the South side of the city. Top Blue stripe represents Lake Michigan and the North Branch of the Chicago River. Bottom Blue stripe represents the South Branch of the Chicago River and the Great Canal. The First Red Star represents Fort Dearborn (added in 1939). The Second Red Star represents the Chicago Fire of October 8-10, 1871. The Third Red Star represents the World's Columbian Exposition of 1893. The Fourth Red Star represents the Century of Progress Exposition of 1933 (added in 1933).